FATE: Died of Wounds sustained at Gallipoli – 3 May 1915 – died and buried at sea. “PRIVATE SIDNEY WALTER GIBSON, of Bendigo.” Bendigonian (Bendigo, Vic. : 1914 – 1918) 13 May 1915: 24. Web. .
Sydney Walter Gibson was born in Moe in 1896 to pastry cooks David Gibson and Hannah Osborne. They had previously spent time in Coleraine where Sydney’s older brother Victor was born in 1893. It appears the family moved frequently and had links to Casterton, Bendigo and Hamilton. Sydney attended Hamilton Elementary School at some stage. During May 1914, Sydney Gibson turned eighteen and on 17 September that year, he enlisted at Casterton. At eighteen, he was 6’1″ and would have towered over some of the men he went on to serve with. 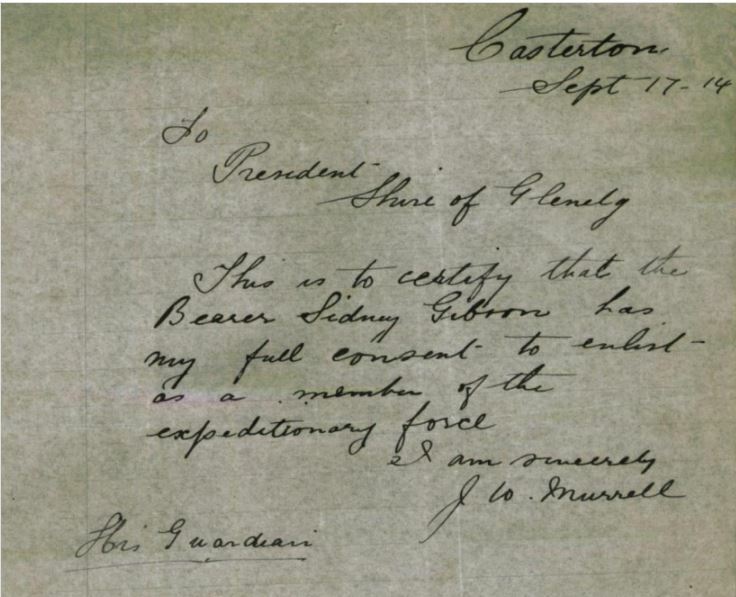 Sydney gave his father’s address as c/o J.W.Murrell of Henty Street, Casterton. It was also J.W.Murrell, acting as Sydney’s guardian, who gave consent for his enlistment. Brother Victor enlisted four days earlier in Bendigo and gave his father’s address as c/o Brown’s Butchers, Hamilton. Sydney, like his parents and brother was a pastry cook and was holidaying in Casterton from his job working for Victor in Bendigo where Victor ran their father’s “Hamilton Pie Shop” in High Street. Sydney was assigned to the 8th Battalion with Victor and they sailed together on 22 December 1914. Sydney was disciplined during the voyage after he went ashore when the ship docked at Colombo. The 8th Battalion was sent to the Dardanelles for the landing at Gallipoli on 25 April, 1915. The two brothers made it through the landing but within a week, Sydney was shot in the hip on 3 May and evacuated to a hospital ship sailing for Alexandria. However, his wounds were severe and he died en route and was buried at sea. In Hamilton, Sydney was remembered with a tree planted along Anzac Avenue. His name also appears on the Casterton Roll of Honour. Fourteen months after the death of Sydney, David and Hannah Gisborne suffered another loss, receiving news their other son Victor had been killed in France on 19 July 1916. David’s way of managing his grief was to publish a collection of bush and war poems in late 1918. Mixed with colourful poems of the Australian bush were dark poems, their titles leaving little doubt about David’s anger and with whom he lay blame for his two son’s deaths. 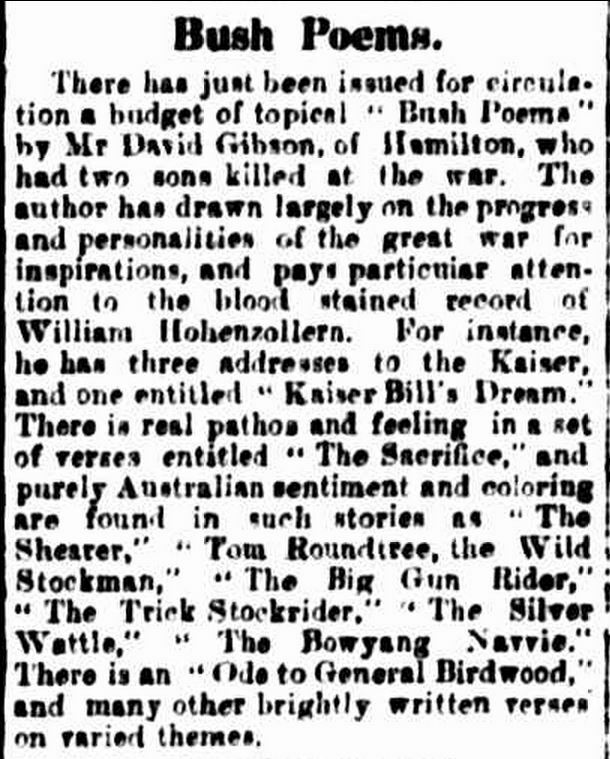 “Bush Poems.” The Casterton News and the Merino and Sandford Record (Vic. : 1914 – 1918) 9 Dec 1918: 3 Edition: Bi-Weekly.. Web. <http://nla.gov.au/nla.news-article74222807&gt;. “[No heading].” Warrnambool Standard (Vic. : 1914 – 1918) 29 Nov 1918: 1 Edition: DAILY.. Web. <http://nla.gov.au/nla.news-page7134314&gt;.